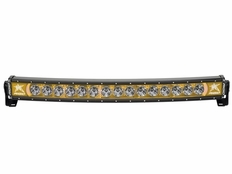 The Radiance+ CURVED LED Light Bar from Rigid Industries is the perfect solution for those who want legendary Rigid quality at an affordable price. The new Radiance Plus line offers 35% more raw lumens than before and is built with the same high-grade aluminum alloy housing as Rigid RDS-Series bars. Inside, Radiance Plus bars are feature-packed, with a black exposed circuit board and optimized forward projecting Broad Spot optics that combine the attributes of a spot and flood beam pattern. Possibly the coolest feature of these light bars, Radiance Plus bars have built-in back-lighting that can be controlled separately from the main LED Lights. Even better, the Radiance Plus light bars now include a wiring harness and multi-trigger switch for a quick and painless installation. The Rigid Industries Radiance Plus light bar is for the customer who wants a truly custom look that only Rigid Industries can provide.